A fabulous choice for modern brides who love the appearance of classic pearl earrings, but do not have their ears pierced, these delightful bridal earrings are a clip-on version, so every member of the wedding party can wear them with ease. Available in silver or gold-plated brass to complement your engagement ring and wedding band, these stunning 8mm white freshwater pearl studs standout beautifully against traditional up-do’s, tumbling curls, and shorter hairstyles. A lovely keepsake for your bridesmaids, they will make a versatile addition to any jewellery collection. 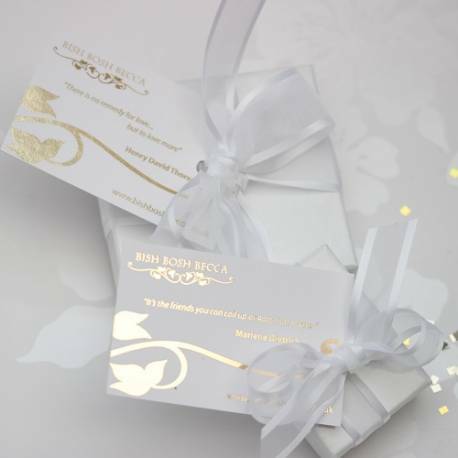 We will carefully package your wedding earrings in a signature Bish Bosh Becca glossy white box, tied with white organza ribbon edged in satin and a gold foil gift card enclosed. The message on the gift card says "there is no remedy for love but to love some more" So it’s beautifully gift wrapped when it arrives with you. Freshwater pearls and silver or gold plated brass.